DataMystic welcomes Microsoft Outlook users! Make Microsoft® Outlook® PST/OST files far smaller, faster and easier to backup! Attachments can detached to disk with a clickable hyperlink left in place (the paperclip icon can be retained to assist searches based on attachments) or deleted. Attachments can be reattached later if required. Entire folders can have their attachments detached, saved, deleted, compressed or restored. 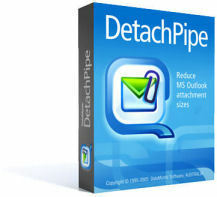 DetachPipe can detach incoming attachments from the Inbox, and re-attach to Forwarded emails in the Outbox. Attachments on Sent Items can be deleted. DetachPipe watches your Deleted Items and offers to remove attachments stored on disk when you delete the related email.